All items are on sale every day with secure online ordering. If you are interested in items not found or have a question please e-mail any questions to printplus@gbonline.com or to Order by phone call PrintPlus Toll Free at 1-888-917-5097. All orders will be confirmed by email. Most gift items are available for shipment in 24 hours, but please allow adequate time for delivery. Most orders are shipped in 2-5 days. Rush shipments may require an additional charge. All merchandise is securely packaged & insured. Your total shipping charge can be viewed at checkout before you make payment. Rates are for the 48 continental U.S. States - Alaska and Hawaii may will require an additional shipping charge. 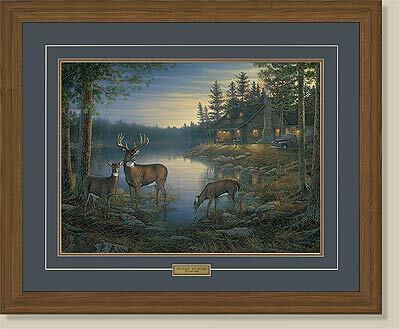 is a reproduction of an original work of Terry Redlin art that is signed and sequentially numbered by Terry Redlin. The total number of prints is limited. Each print includes a certificate of authenticity which is a statement of authenticity of the limited-edition print that records the title of the work, the artist's name, the edition size and the print's number within the edition, the number of artist's proofs and the release date. It is a guarantee that the edition is limited and that the image will not be published again in the same form. Print image size can vary, but the standard Limited Edition image is 18 1/2" x 32" with a framed size of 28 1/2" x 42" or approximately ten inches wider and ten inches higher than the image size. open edition prints are large sized 14" x 24" with "Spring Morning" measuring 16 1/2" x 28 5/8". The outer dimensions of the frame are about 24" x 34". Each is printed on high quality pH neutral paper with light fast inks and with artist's signature printed in the image area. Each print is either sequentially hand-numbered or comes with a Certificate of Authenticity. Each is framed in deluxe framing with double matted acid free suede top mat, name plate and protective glass. 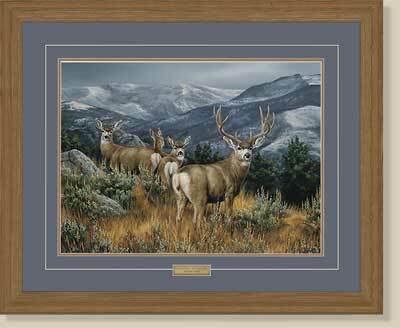 of Terry Redlin prints offers you each of 6 Terry Redlin prints framed with double mats and title plate. Frame Size 18-3/4 x 24". The 6 Terry Redlin Prints Are: Old Logger's Trail • Autumn Shoreline • Apple River Mallards • Together for the Season • Over the Blowdown • Winter Snows. 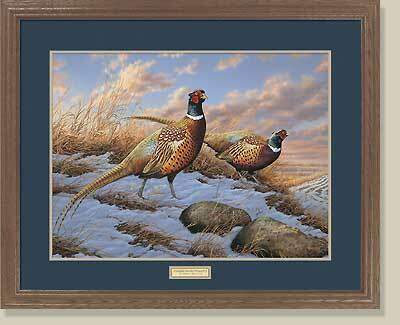 These Encore I Terry Redlin prints are all open editions with image sizes of 8 3/4" x 14". Terry Redlin's signature is printed within the image area. Terry Redlin prints are all open editions with image sizes of 10 1/2" x 18", except "Winter Haven" which is 12 7/8" x 11 1/2". Framed size is 17" x 24" with title plate, except "Winter Haven which is 22 7/8" x 21 1/2". Terry Redlin's signature is printed within the image area. All prints are serially numbered. make owning a redlin print affordable for everyone! These images faithfully reproduce the look and feel of the original painting on ph-neutral linen for a traditional, old-world appearance. Images are protected and sealed with an ultra-violet resistant film. MASTER STROKE Image size, 7-3/4" x 13-3/4". Framed size, 13" x 19" with wood-grain-finish moulding, linen liner, fillet and brass name plate. OVAL LINENS measure 15" x 19" with 1" oak-finished oval moulding. All prints are listed alphabetically by their official title. Click on the alpha section to find your print by title. Each title may be available in one or more of the Terry redlin print editions: Canvas, Limited, Elite, Encore, Horizon, or Pinnacle editions. Terry Redlin's classic scenes are beautifully portrayed in fine porcelain and highlighted with a 23K gold rim. Limited to 45 firing days. Some plates are available in two sizes 8-1/4" or 9 1/4" dia. Each includes Certificate of Authenticity.